Microeconomics (or price theory) is a branch of economics that studies how individuals, households, and firms make decisions to allocate limited resources, typically in markets where goods or services are being bought and sold. Microeconomics examines how these decisions and behaviors affect the supply and demand for goods and services, which determines prices, and how prices, in turn, determine the supply and demand of goods and services. Macroeconomics, on the other hand, involves the sum total of economic activity, dealing with the issues of growth, inflation, and unemployment and the policies relating to these issues. Microeconomics is particularly concerned with situations of "market failure," situation sin which a given market does not efficiently organize production or allocate goods and services to consumers. In such situations, the inefficiency has an undesirable impact, with consumers unable to purchase the items they need at a reasonable price, or producers being unable to sell their goods or services, or the market forces may not serve the public interest well. When microeconomic models are successful, they can avoid such problematic situations, leading to greater satisfaction and prosperity for all. One of the goals of microeconomics is to analyze market mechanisms that establish relative prices amongst goods and services and allocation of limited resources amongst many alternative uses. Microeconomics analyzes market failure, where markets fail to produce efficient results, as well as describing the theoretical conditions needed for perfect competition. Significant fields of study in microeconomics include general equilibrium, markets under asymmetric information, choice under uncertainty and economic applications of game theory. Also considered is the elasticity of products within the market system. The theory of supply and demand usually assumes that markets are perfectly competitive. This implies that there are many buyers and sellers in the market and none of them have the capacity to significantly influence prices of goods and services. In many real-life transactions, the assumption fails because some individual buyers or sellers or groups of buyers or sellers do have the ability to influence prices. Quite often a sophisticated analysis is required to understand the demand-supply equation of a good. However, the theory works well in simple situations. Mainstream economics does not assume a priori that markets are preferable to other forms of social organization. In fact, much analysis is devoted to cases where so-called market failures lead to resource allocation that is suboptimal by some standard (highways are the classic example, profitable to all for use but not directly profitable for anyone to finance). In such cases, economists may attempt to find policies that will avoid waste directly by government control, indirectly by regulation that induces market participants to act in a manner consistent with optimal welfare, or by creating "missing markets" to enable efficient trading where none had previously existed. This is studied in the field of collective action. Market failure in positive economics (microeconomics) is limited in implications without mixing the belief of the economist and his or her theory. The demand for various commodities by individuals is generally thought of as the outcome of a utility-maximizing process. The interpretation of this relationship between price and quantity demanded of a given good is that, given all the other goods and constraints, this set of choices is that one which makes the consumer happiest. Business firms are assumed to be the main players in an economy as they buy and sell goods and services on the largest scale. It is assumed that all firms are following rational decision-making, and will produce at the profit-maximizing output. Given this assumption, there are four categories in which a firm's profit may be considered. A firm is said to be making an economic profit when its average total cost is less than the price of each additional product at the profit-maximizing output. 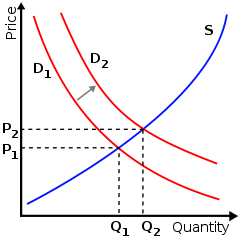 The economic profit is equal to the quantity output multiplied by the difference between the average total cost and the price. A firm is said to be making a normal profit when its economic profit equals zero. This occurs where average total cost equals price at the profit-maximizing output. If the price is between average total cost and average variable cost at the profit-maximizing output, then the firm is said to be in a loss-minimizing condition. The firm should still continue to produce, however, since its loss would be larger if it were to stop producing. By continuing production, the firm can offset its variable cost and at least part of its fixed cost, but by stopping completely it would lose the entirety of its fixed cost. If the price is below average variable cost at the profit-maximizing output, the firm should go into shutdown. Losses are minimized by not producing at all, since any production would not generate returns significant enough to offset any fixed cost and part of the variable cost. By not producing, the firm loses only its fixed cost. By losing this fixed cost the company faces a challenge. It must either exit the market or remain in the market and risk a complete loss. In microeconomics, the term "market failure" does not mean that a given market has ceased functioning. Instead, a market failure is a situation in which a given market does not efficiently organize production or allocate goods and services to consumers. Economists normally apply the term to situations where the inefficiency is particularly dramatic, or when it is suggested that non-market institutions would provide a more desirable result. On the other hand, in a political context, stakeholders may use the term market failure to refer to situations where market forces do not serve the public interest. Monopolies or other cases of abuse of market power where a "single buyer or seller can exert significant influence over prices or output"). Abuse of market power can be reduced by using antitrust regulations. Externalities, which occur in cases where the "market does not take into account the impact of an economic activity on outsiders." There are positive externalities and negative externalities. Positive externalities occur in cases such as when a television program on family health improves the public's health. Negative externalities occur in cases such as when a company’s processes pollutes air or waterways. Negative externalities can be reduced by using government regulations, taxes, or subsidies, or by using property rights to force companies and individuals to take the impacts of their economic activity into account. Cases where there is asymmetric information or uncertainty (information inefficiency). Information asymmetry occurs when one party to a transaction has more or better information than the other party. Typically it is the seller that knows more about the product than the buyer, but this is not always the case. Buyers in some markets have better information than the Sellers. For example, used-car salespeople may know whether a used car has been used as a delivery vehicle or taxi, information that may not be available to buyers. An example of a situation where the buyer may have better information than the seller would be an estate sale of a house, as required by a last will and testament. A real estate broker purchasing this house may have more information about the house than the family members of the deceased. Economics is defined as the study of how to best allocate scarce resources. As such, deciding which if two options provides optimal returns for minimal cost is key. Opportunity cost is one way to measure the cost of something. Rather than merely identifying and adding the costs of a project, one may also identify the next best alternative way to spend the same amount of money. The forgone profit of this next best alternative is the opportunity cost of the original choice. A common example is a farmer that chooses to farm his land rather than rent it to neighbors, wherein the opportunity cost is the forgone profit from renting. In this case, the farmer may expect to generate more profit himself. Similarly, the opportunity cost of attending university is the lost wages a student could have earned in the workforce, rather than the cost of tuition, books, and other requisite items (whose sum makes up the total cost of attendance). The opportunity cost of a vacation in the Bahamas might be the down payment money for a house. Note that opportunity cost is not the sum of the available alternatives, but rather the benefit of the single, best alternative. Possible opportunity costs of the city's decision to build the hospital on its vacant land are the loss of the land for a sporting center, or the inability to use the land for a parking lot, or the money that could have been made from selling the land, or the loss of any of the various other possible uses—but not all of these in aggregate. The true opportunity cost would be the forgone profit of the most lucrative of those listed. One question that arises here is how to assess the benefit of dissimilar alternatives. We must determine a monetary value associated with each alternative to facilitate comparison and assess opportunity cost, which may be more or less difficult depending on the things we are trying to compare. For example, many decisions involve environmental impacts whose monetary value is difficult to assess because of scientific uncertainty. Valuing a human life or the economic impact of an Arctic oil spill involves making subjective choices with ethical implications. Applied microeconomics includes a range of specialized areas of study, many of which draw on methods from other fields. Much applied works uses little more than the basics of price theory, supply and demand. Industrial organization and regulation examines topics such as the entry and exit of firms, innovation, and the role of trademarks. Law and economics applies microeconomic principles to the selection and enforcement of competing legal regimes and their relative efficiencies. Labor economics examines wages, employment, and labor market dynamics. Public finance (also called public economics) examines the design of government tax and expenditure policies and economic effects of these policies (e.g., social insurance programs). Political economy examines the role of political institutions in determining policy outcomes. Health economics examines the organization of health care systems, including the role of the health care workforce and health insurance programs. Urban economics, which examines the challenges faced by cities, such as are sprawl, air and water pollution, traffic congestion, and poverty, draws on the fields of urban geography and sociology. The field of financial economics examines topics such as the structure of optimal portfolios, the rate of return to capital, econometric analysis of security returns, and corporate financial behavior. The field of economic history examines the evolution of the economy and economic institutions, using methods and techniques from the fields of economics, history, geography, sociology, psychology, and political science. ↑ 1.0 1.1 1.2 1.3 Market Failure The Economist. Retrieved November 11, 2007. This page was last modified on 3 October 2018, at 16:48.